You are T-Pain with Auto-Tune in the palm of your hand, scrolling lyrics and T-Pain’s best beats incl. Bartender, Kiss Kiss, I’m Sprung, I’m in Luv (Wit a Stripper) and more. As featured on The Ellen Show, Jimmy Kimmel Live, the Jimmy Fallon Show, and Auto-Tune the News. I Am T-Pain users have already created over 34.7 million Auto-Tuned recordings using the App. “Maybe the best use of the front-facing camera I’ve seen yet comes from Smule’s auto-tunetastic I Am T-Pain app.” – Gizmodo on the recent 1.5 update. 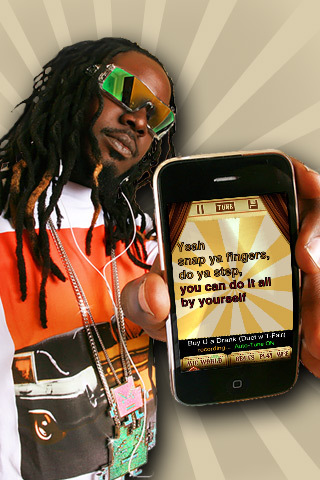 Launch the I Am T-Pain app, select your favorite track, and just sing into the Mic on your iPhone. I Am T-Pain will record and Auto-Tune your voice. Then, with a single button, share your song over email, Facebook, or MySpace. • The App bundles several of T-Pain’s top songs including Bartender and I’m N Luv (Wit a Stripper), complete with lyrics, integrated Auto-Tune settings, and timings. • The App includes many previously unreleased T-Pain original beats. • Additional songs including On A Boat, Buy U A Drank, and Good Life can be purchased within the App. • Use Auto-Tune with your existing iTunes library. • You can select the Freestyle option and use Auto-Tune for singing without companion tracks. Use this option if you simply want to send someone an Auto-Tuned greeting over email (Shawwttay!). • With the 1.5 Update, you can also create your own auto-tuned videos (iOS 4.0 required with iPhone 3GS or iPhone 4). • Tired of being drunk dialed in the middle of the night by that special friend who needs to talk? Return the favor and leave Auto-Tuned phone messages with the T-Pain Dialer, new update 1.6.
http://iamtpain.smule.com/ features top Auto-Tuned performances around the world, based on the amount of “Love” your songs receive on Facebook or MySpace. We recommend using the headphones with the integrated microphone that came bundled with your iPhone (REQUIRED for iPad, first gen iPhone and iPod touch; the first gen iPod touch has no Mic and so won’t work with this App). Any questions? Write support@smule.com and we will write back shortly! Check out the latest from Smule: Magic Piano for iPad and the new Glee App!